Please check out our Facebook page for 2015 photos — comment and tag away! Big thanks to Brian Hester and Richard Frant for their great photos once again this year! 525 participants crossed the finish line! Our largest event to date. Thank you all for your tremendous support and participating this year. We’ll be posting pictures on our Facebook page soon, so keep an eye out. We look forward to seeing you next year! We’re excited to have you at Sunday’s run/walk and appreciate your support of the event and the Bruce Eckrote Memorial Fund. This year promises to be another fun event! We are honored to be contributing this year’s proceeds to two amazing local families, our annual scholarships, and two prestigious medical organizations. Details on the beneficiaries are listed below. IMPORTANT NOTE: For anyone that has participated in the past, this year’s course will be in reverse. We will now be running/walking COUNTER-CLOCKWISE around the lake. It will start going down Lake Drive West, and then finish up on Lake Drive East. There will be plenty of arrows, volunteers, and police directing you, so just follow the way! Below is important info for the event including times, course, parking, etc. If you have any questions email us at borntorun5k@gmail.com. Please forward this to anyone you may have registered but not included their email addresses. 5K IS ON SUNDAY, SEPTEMBER 13th. Check-in starts @ 7:30am, run/walk line-up begins @ 8:40am, and the 5K starts PROMPTLY @ 9:00am. Directions: Check-in and start/stop takes place in back of Packanack Elementary School – 190 Oakwood Drive, Wayne, NJ 07470 Click here for Google Map. Bib Timing: Your bib contains a chip that will time you. Simply wear your bibs (attach to shirt with safety pins provided) and you’re all set. You can keep or dispose of the bib after race, no need to return. Pre-Race: Visit the refreshment tent for fruit, bagels, and water. Professionals from Performance Physical Therapy and Sportscare Institute will be on site to stretch out participants. And check out the pink firetruck from Guardians of the Ribbon, raising awareness for breast cancer… and even sign it! Medical Staff: There will be an EMT present throughout the event– please let a volunteer know if you need assistance. Toilets: There will be 3 port-o-potties available. If nature calls, please allow plenty of time prior to the race so you’re not waiting on line when the event starts. Start of 5K: Run/walk lining up at the start line will begin at 8:40am, followed by announcements and National Anthem, and the race starts promptly at 9:00am. There will be announcements and volunteers guiding participants to the start line (behind pink firetruck). Runners should go towards the front of the start line, and walkers should stay in the back. Course: The start is on Lake Drive West by the school, and ending is on the pavement of the school. We’ll be running/walking counter-clockwise around Packanack Lake, with a slight detour at the end through a neighborhood. Click here for map of the course. There will be bright orange arrows and volunteers guiding you throughout the course. There will also be Wayne Police assisting with traffic and safety around the course. Please stay to the inner side of the road and remember that we’ll be sharing the road with vehicles– please run/walk against traffic. Please be respectful of any drivers. Water Stations: There are two water stations on the course, at 1.3 and 2.1 miles. Please dispose of the cups in the garbage bags! Awards: There will be cash prizes for overall 1st, 2nd, and 3rd place (male and female), and medals for top 3 winners in each age category (male and female — 14 & Under, 15-18, 19-29, 30-39, 40-49, 50-59, 60-69, 70+); winners announced immediately following conclusion of race. Results & Photos: Check back on our website and Facebook page for the results and hundreds of photos after the event. 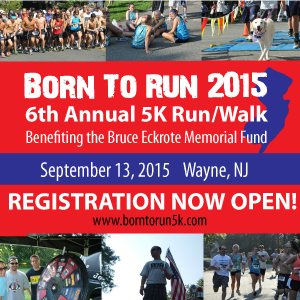 2015 marks the sixth year for the Born to Run 5K commemorating the life and ongoing legacy of Bruce Eckrote. Sunday’s race echoes the course around the lake that Bruce, a Wayne resident, ran several times a week, even up until the end. Although the loss of Bruce in 2009 has left a huge void in the lives of his family and friends, his legacy will live on forever in the lives of those he influenced. Bruce was a practical man and known for his generosity and kind-hearted nature. Bruce’s devotion to giving back to his community as well as his dedication to running will be captured in this great event. In the first five years we have raised over $65,000 with 100% of proceeds going towards community causes, scholarship, and medical support, and we’re excited for another successful year. We know Bruce would be proud of his ongoing effect on this world. And his family and friends can’t thank you enough for your support this year — now let’s rock and run/walk on!!! THANKS AGAIN AND WE’RE LOOKING FORWARD TO A GREAT EVENT ON SUNDAY!!! Please note that this year’s course is REVERSED. Same streets, but it will now be run counter-clockwise around the lake. There will be two water stations at approximately the 1 and 2 mile markers. Police and volunteers will continue to be stationed around the course. We are honored and privileged to be supporting two deserving Wayne families this year — the Ragusa and Catalano families. Additionally, we will continue to support scholarships at Wayne Valley and Wayne Hills high Schools, Memorial Sloan Kettering Cancer Center, and Hackensack University Medical Center. Thank you for your continued support of this event and it’s causes as we continue to keep Bruce’s legacy alive! 2015 Registration is OPEN! Race on Sunday, September 13th! Sponsors, runners, and walkers wanted! Please enjoy and feel free to tag & share! 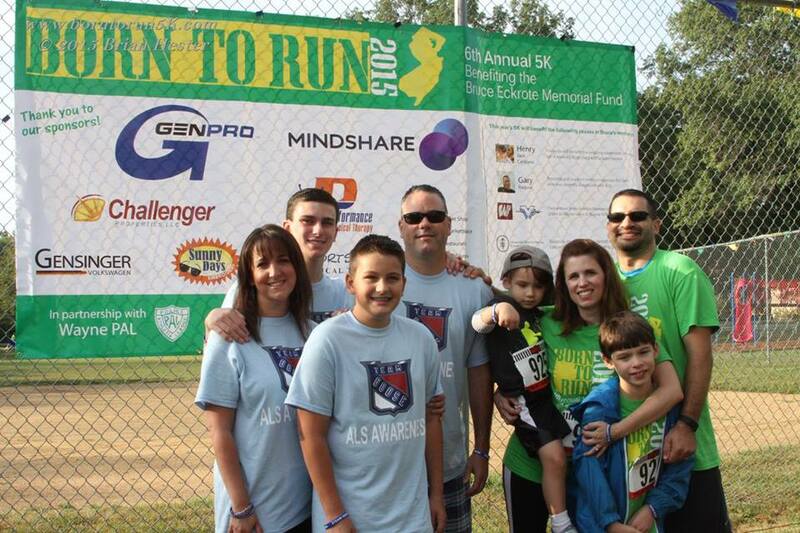 We’re excited to have you at Sunday’s run/walk and appreciate your support of the Bruce Eckrote Memorial Fund. This year promises to be another fun event and the forecast is looking great! Below is important info for the event including times, course, parking, etc. If you have any questions email us at borntorun5k@gmail.com. 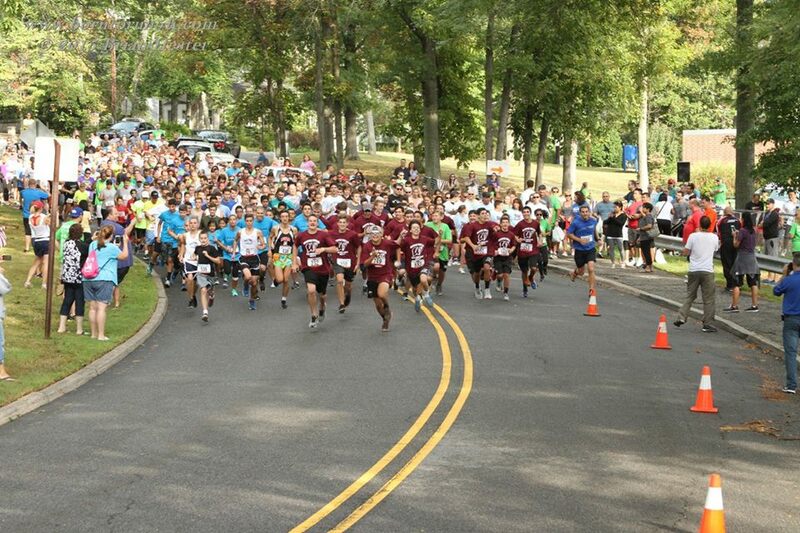 THE 5K IS ON SUNDAY, SEPTEMBER 21st. (Please do not come on Saturday!) Check-in starts @ 7:30am, run/walk line-up begins @ 8:40am, and the 5K starts PROMPTLY @ 9:00am. Day-of registration @ 7:30am: There will be a separate table for those to register the day of the event. Cost is $25/participant and cash or check (payable to “Bruce Eckrote Memorial Fund”) will be accepted. To save time, please print and fill out this registration form prior to Sunday if possible. IMPORTANT NOTE: there are no shirts remaining due to the overwhelming and generous registrations so far this year. **NEW** Bib Timing: This year’s event will be timed with chips contained in the bibs. There will not be additional chips to attach to your shoe this year. Simply wear your bibs (attach to shirt with safety pins provided at table) and you’re all set. You can keep or dispose of the bib after race, no need to return. Pre-Race: Visit the refreshment tent for fruit, bagels, and water. Professionals from Sportscare Institute will be on site to stretch out participants. And check out the pink firetruck from Guardians of the Ribbon, raising awareness for breast cancer… and even sign it! Awards: There will be prizes for 1st, 2nd, and 3rd place (male and female), and other prizes for winners in each age category (male and female); announced immediately following conclusion of race. Route: The start is on Lake Drive West by the school, and ending is on the pavement of the school. We’ll be running/walking clockwise around Packanack Lake, with a slight detour at the beginning through a neighborhood. Click here for map of the course. There will be bright orange arrows and volunteers guiding you throughout the course. There will also be Wayne Police assisting with traffic and safety around the course. Course: Please stay to the outer side of the road and remember that we’ll be sharing the road with vehicles– please run/walk against traffic. Please be respectful of any drivers. There is a hill at the beginning, after that it’s a nice rolling course. 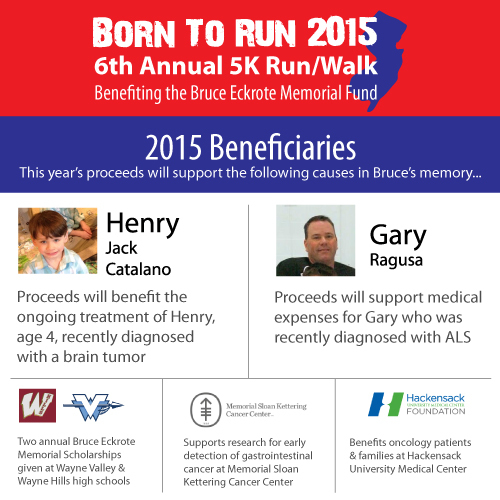 2014 marks the fifth year for the Born to Run 5K commemorating the life and ongoing legacy of Bruce Eckrote. Sunday’s race echoes the course around the lake that Bruce, a Wayne resident, ran several times a week, even up until the end. In the first four years we have raised over $50,000 with 100% of proceeds going towards community causes, scholarship, and medical support, and we’re excited for another successful year. We know Bruce would be proud of his ongoing effect on this world. And his family and friends can’t thank you enough for your support this year — now let’s rock and run/walk on!!! Lily LaRue Anderson: This year’s community beneficiary is Wayne resident Lily, age 6. Lily was diagnosed with Diffuse Intrinsic Pontine Glioma (DIPG) in early May and is currently undergoing treatment. Proceeds will benefit the Anderson family and fun-loving Lily during their ongoing journey.